...lives in Jeffersonville, VT, USA. Contact her at Quilts By Elaine, elaine@quiltsbyelaine.com. 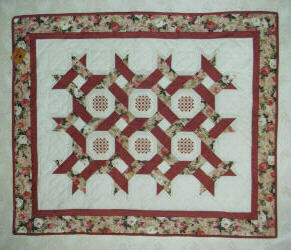 This hand quilted wall hanging is created with squares and rectangles of quality 100% cotton. Victorian print and solid fabrics alternate in interlocking circles forming the Cane Weave pattern. The center of each circle contains Hardanger embroidery, a geometric form of stitching based on the number four. This type of embroidery combines Satin Stitch, Cutwork, Drawnwork and Needleweaving to create a beautiful intricate look. Each of the six Hardanger centers are hand stitched by Terry Ladue. To complete the wall hanging and add dimension to the piece, a design of delicate stitches are hand quilted on the background fabric. Each unique quilt is created using your choice of three different fabrics, ensuring a Rings of Romance quilt that will compliment your home or office decor.